Working at Honolulu Community College for over four years, I noticed that there has been no change in the scenery at the Diesel facility on Kōkea Street. Every year it looks dryer and dryer. The dirt is dry, which makes for very dusty conditions. A lot of the students have made comments that the facility looks “dry and old,” so I figure it would be a good opportunity to make a small change. My wife Juanita and our children are practicing sustainability at home by growing plants that will help to feed our family and raising hens that will eventually produce one or two eggs per day. I even assembled an aquaponics system at home to grow fish and vegetables. The fish and plants grow at substantial rates due to its enriched environment. The plants have high nitrates (fertilizer) from the fishes and the fishes grow from the “clean” water that the plants provide. We are growing tomatoes, cucumbers, eggplant, kalo, bitter melon, papaya, avocado, beans, soy beans, bananas, grapes, various pepper plants, okra, etc. We also have two rabbits that give our plants great fertilizer, and the chickens provide fertilizer too. We have a worm bin that will produce the best organic fertilizer possible, and hey eat our fruit and vegetable scraps. 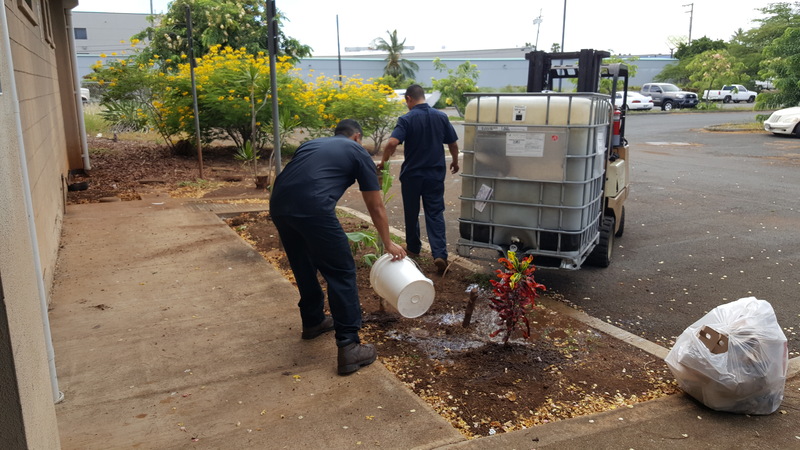 Our kalo was growing well, and needed more space then we can provide at home, so my wife suggested planting some at the Diesel facility. I had a few students that needed to make up time for a variety of reasons. I thought it would be a good idea to plant the seed of sustainability (and responsibility) in these students. When I told them what they had to do, I was surprised they were all actually excited to beautify the facility. 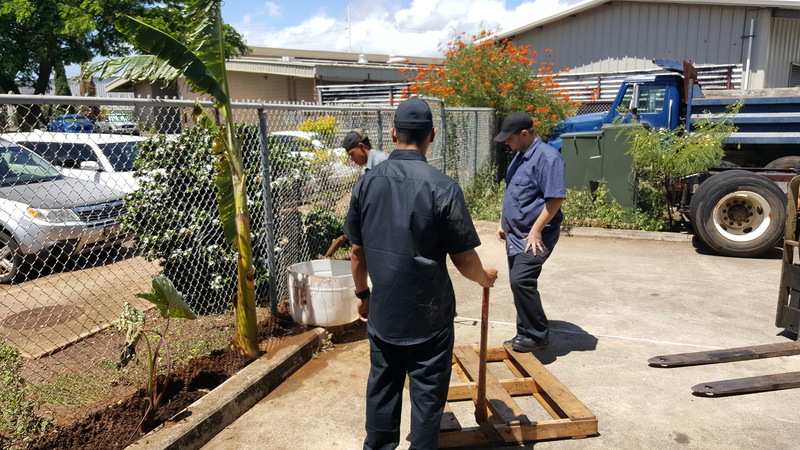 And so it began….We started small growing two banana trees, two bunches of kalo, a lime tree, and a papaya tree on the side of our fenced classroom where the A/C evaporator drips water. Might as well use that condensed water to feed the plants rather than to go to waste. I previously had a 325 gallon water catchment system that catches the rainwater from our small remote building. It was full, so we used it to start the process of softening the soil before we planted those plants. We will use the water catchment for future watering of the plants as needed. The plants looked really nice and added needed color to the facility. We couldn’t stop there, so we planted more plants near the front entrance. As we watered the plants we noticed the water kept running downwards onto the parking lot. We improvised a water run out barrier by cutting a 55-gallon plastic drum. It worked well. We are all proud of what we did to help to breath new “life” to our second home. We are all excited to see what the future has in store for our plants. We can’t wait to nourish our bodies with the fruits of our labor! We have other beautification plans and look forward to expanding our garden with more variety of edible plants. that will provide better ground coverage and shade. The dirt will retain moisture longer, and will require less watering of the plants. The bonus is that these plants will add that missing green color we all so deserve.